1. 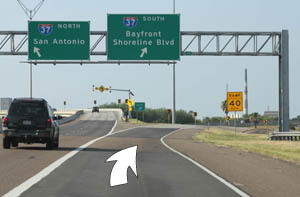 Exit the airport and turn right onto SH 44 freeway frontage road. Follow signs leading to BAYFRONT. 2. Move into left lane and take ramp onto SH 44 freeway eastbound toward the city. Follow to BAYFRONT signs. 3. 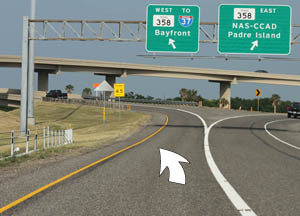 Travel 1.8 miles, move to left and keep left at the fork, following the signage onto SH 358 freeway northbound - to BAYFRONT. 4. Move to the right and travel north approximately 1 mile. At fork take right lane ramp following signs to Interstate 37 and BAYFRONT. 5. Travel east approximately 4 miles on I-37 toward Downtown and BAYFRONT..
6. As you approach Central Business District move to the right. 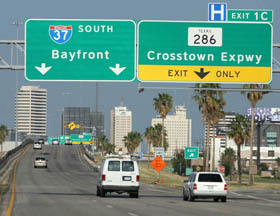 EXIT right following the signage to PORTLAND via US 181 and SH 35 over the Harbor Bridge. 7. 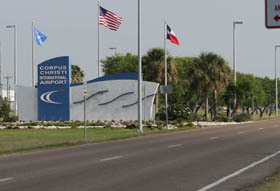 From Bayfront/Downtown area take one of several entrance ramps to the Corpus Christi HARBOR BRIDGE which is the US 181/SH 35 North freeway. From Shoreline Blvd turn on to I-37 & Harbor Bridge approach. 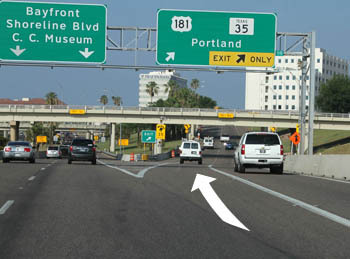 Move to the right lane as you pass through traffic signals and take right ramp to US 181 and PORTLAND. 8. 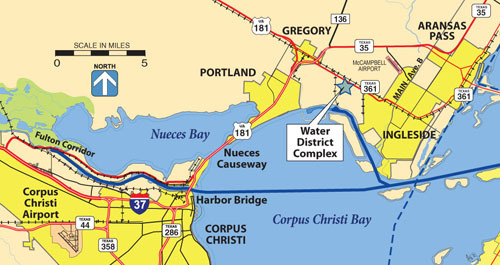 ON HARBOR BRIDGE go north across ship channel, stay on the freeway and continue across the Nueces Bay Causeway, a distance of 6.5 miles. 9. 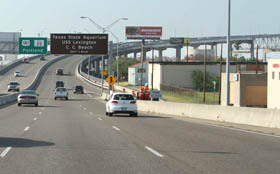 The elevated Nueces Bay Causeway carries you in a straight line across the bay entrance. As you approach Portland continue on the main freeway lanes of US 181/SH 35. 10. Continue on the main lanes through the Moore Avenue underpass, shifting to the center lane and proceed on past the exits for Wildcat Drive, Buddy Ganem Drive and La Quinta Terminal, a distance of 3.1 miles. 11. 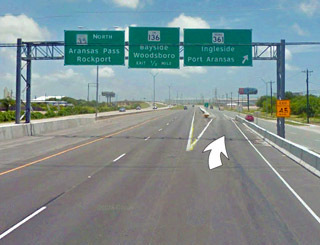 As you approach Gregory, US 181 traffic will exit to the right. 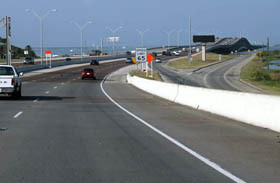 Stay to the LEFT on the SH 35 main lanes, following the signage toward Aransas Pass & Rockport. 12. 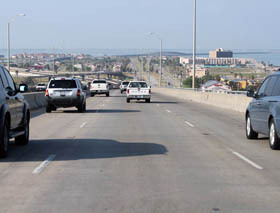 Travel over the overpass, which curves to the right, for a distance of 0.6 mile. 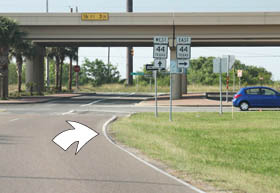 Move to the right lane in order to EXIT RIGHT, leaving the freeway on the SH 361 exit. 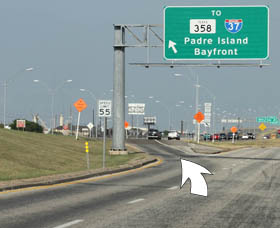 Follow the signage directing toward Ingleside & Port Aransas. Go 0.6 mile on the frontage road passing the entrance to Cheniere on La Quinta Road. 13. 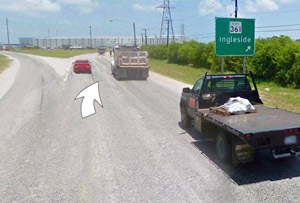 Move to the right lane and follow the SH 361 - Ingleside signage onto the divided highway flowing southeast. 14. Pass through the rail crossing that cuts across the highway just before you come to the signalized intersection with the Sherwin property entrance road. Go straight an additional 1.1 miles passing the Naismith Reservoir on the left. 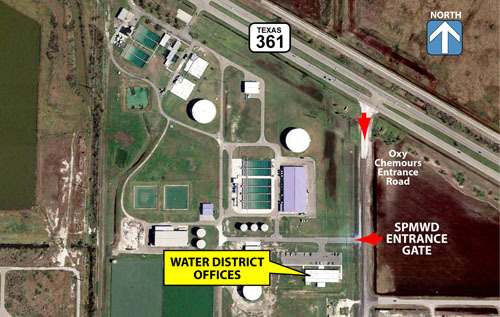 On the right you will see two large domed ground storage tanks which are within the fenced Water District complex. 15. Move to the right turning lane and TURN RIGHT at the traffic light onto the industrial entrance road marked by the landmark signs for Oxy and Chemours. 16. Head south 250 yards to the Water District entrance and security gate.